It is what so many of us were told as little kids as we flicked peas across the table at our siblings or buried offensive vegetables in our mash potatoes. However, we are proud to report that as adults and food enthusiasts we are getting our ultimate revenge! One of the great things about hands on courses, like the one we attended at UW Madison’s CDR, is the time spent in their pilot plant. Though the work they do here for the dairy industry is incredibly important; for anyone lucky enough to be invited here, it is the ideal playground! What this plant offers to enthusiasts like us is the ability to see concepts in action. To put your hands in, on, and through the cheese and cheesemaking process and to understand the delicate balance that goes into pushing the science to create art. Ok, and who are we kidding, it is also the ultimate excuse to play with your food! And the ultimate of fun foods in this plant is the pasta filata cheeses! 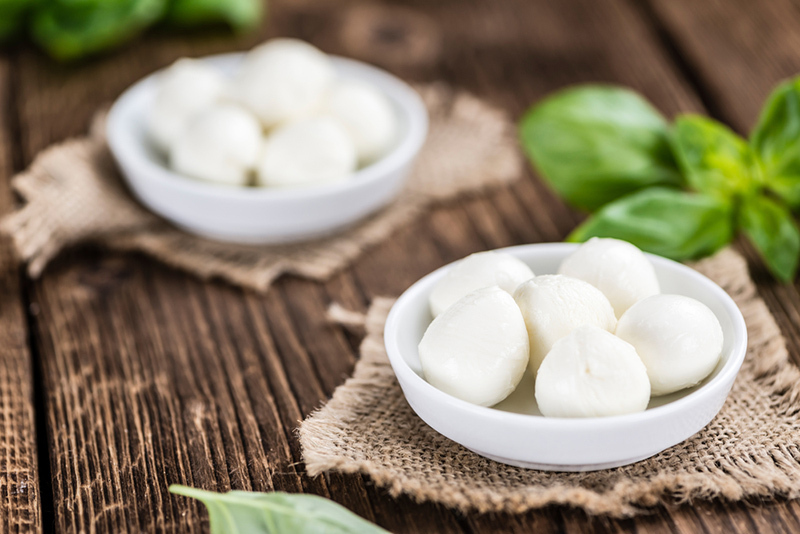 Pasta filata or “spun paste” is the name given to the class of cheeses that is stringy, stretchy, creamy perfection. 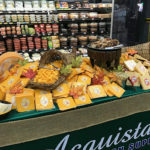 Often referred to as stretched curd, pulled curd, or plastic curd, the cheeses in this class are known for their stringy texture, melt, and stretching ability. Think glorious strings of melted mozzarella stretching from your favorite pizza slice! What makes this class of cheese so special is the filatura process that it undergoes towards the end of the make. Up until that point it starts out as many other cheeses do, with high quality milk, a warm vat, and experienced cheesemakers (and in our case some very eager participants). 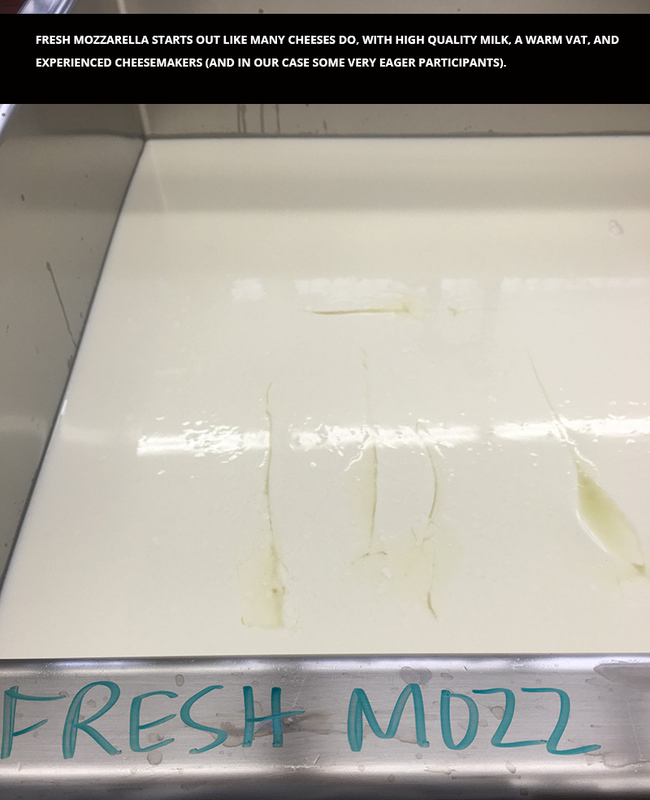 Once the culture and rennet have been added to the milk and have been given time to work their magic, the mass is tested for the right consistency; letting the curd tell when it is ready to move to the next step. The mass is then cut several times using a quick and consistent movement to develop right sized curds for the style of cheese being made. As the curds are cut the whey begins to emerge and the vat gets readied for draining of the whey. 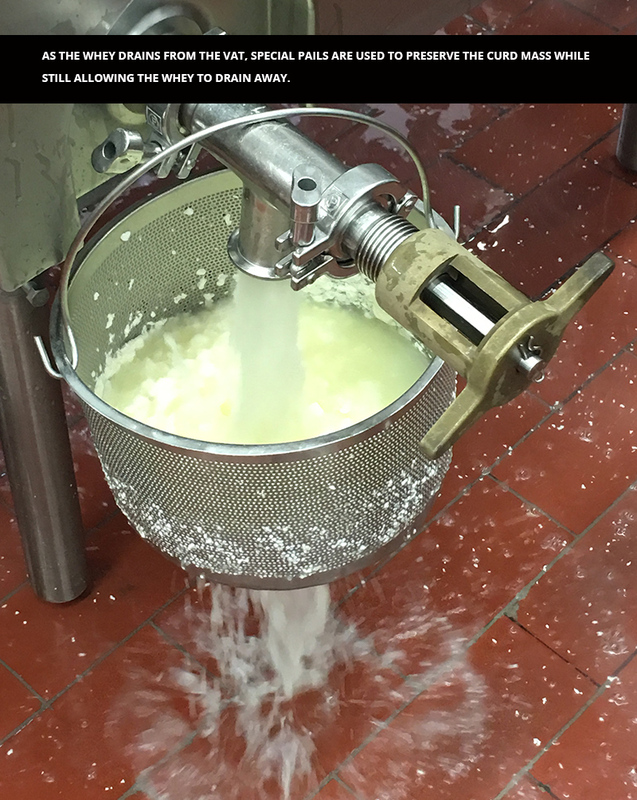 As the whey drains from the vat, special pails are used to preserve the curd mass while still allowing the whey to drain away. 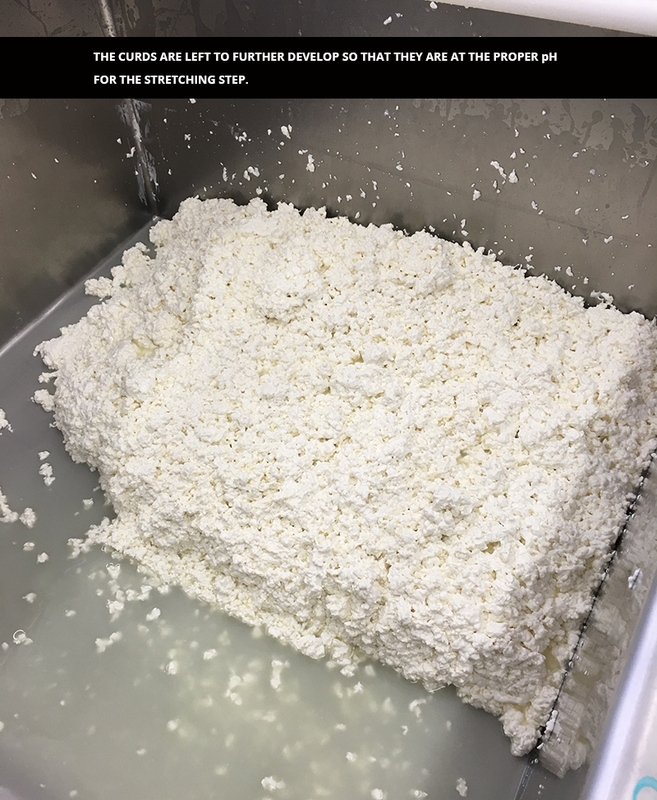 Once this process is complete the curds are left to further develop so that they are at the proper pH for the stretching step. Too high or too low and the curd won’t stretch properly. Once the curd has properly ripened it is time for the stretching process to occur. 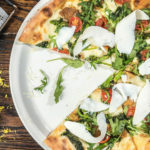 If the proper processes have taken place, the acid present in the cheese will have helped to remove some of the calcium (creating a less rigid structure) and making way for the cheese to become more pliable. 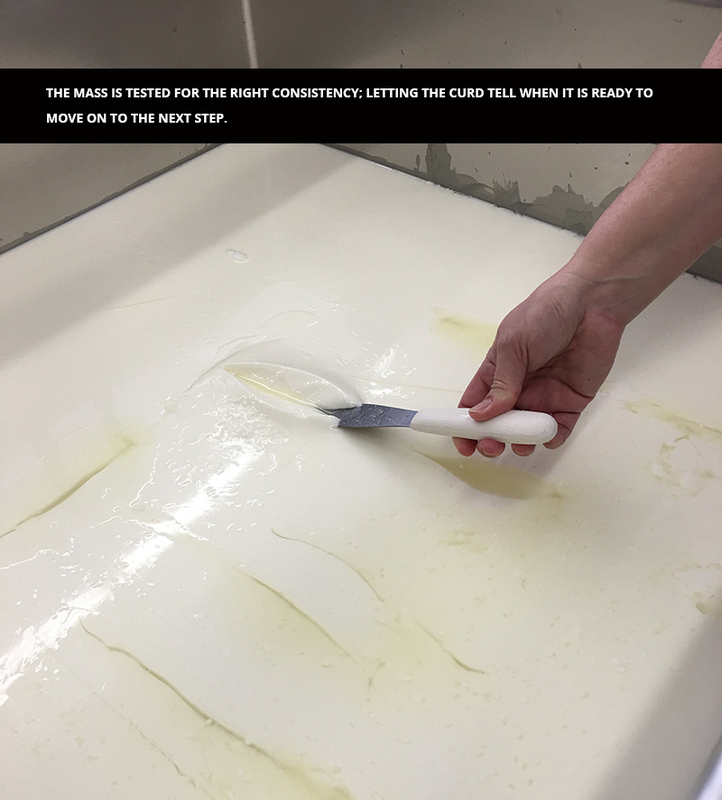 The curd is then submerged in hot water or hot whey which essentially causes the molecules in the less rigid structure to align so that the curd can be stretched. It then goes through a kneading and stretching mechanism that encourages the formation of the silky, stretchy structure we expect from the pasta filata cheeses. After the curd is stretched and pulled it needs to be made into one of the many forms for further processing and eventual sale to consumers. The type of end product ultimately determines what process the stretched curd will go through next. Remember that cool fun factory you wanted a as a kid? You know the one where you could extrude, roll, stretch, press, and mold colorful dough into amazing shapes and long never ending ropes? Pasta filata factories are where this childhood love and a passion for food come joyously crashing together! 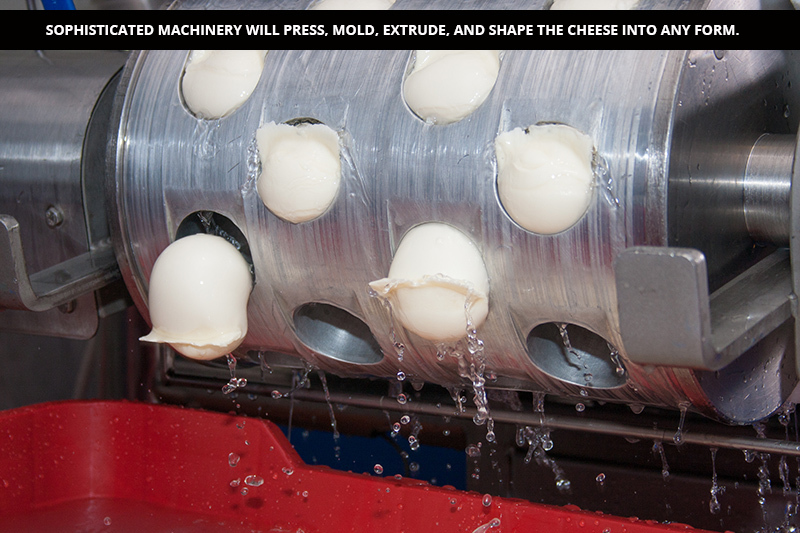 Sophisticated machinery will press, mold, extrude, and shape the cheese into any form from string cheese sticks, pearls, ciliegine (small balls) to larger balls and loaves. 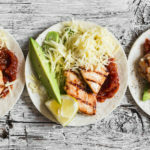 Much like your fun factory, special molding wheels or extruders are put on to the machine to get the desired shape and send it down the line to be further processed (wound like queso Oaxaca or braided with other ingredients) or packed. 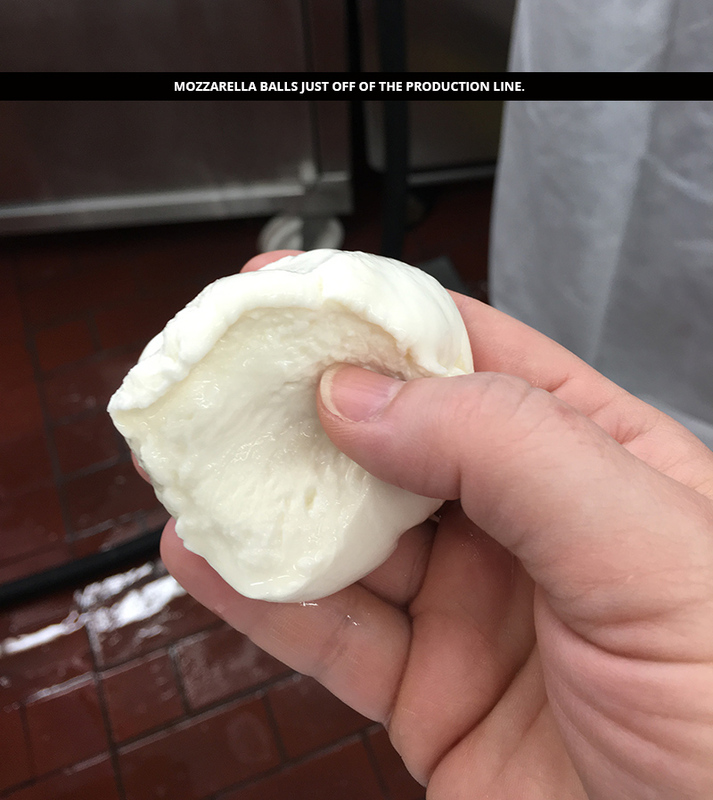 Few things are more glorious than freshly stretched cheese right off the line! 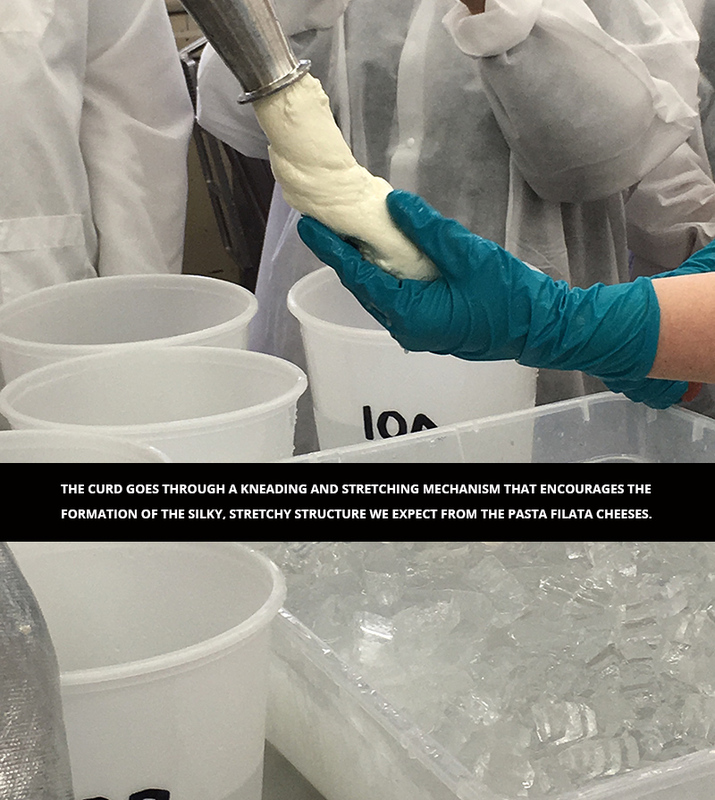 We greatly enjoyed our time in the CDR’s pilot lab (especially seeing how many times we could stretch our “string cheese” around the room) and it was an incredible opportunity to see the magic of pasta filata cheeses in person from start to finish. We officially give you all permission to play with your food!